Made from recycled glass and available in a full range of sizes - litre, 750, 500, 330 and 250ml - in either Still or Lightly Sparkling, Sole Classic Italian is a fitting compliment to any dining experience. 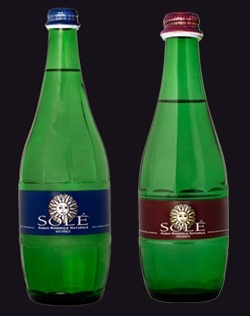 Renowned for its high quality and low sodium content Sole Classic Italian refreshes and cleanses your palate whilst having a slightly sweet taste. Sole Classic Italian has a highly elegant look that enhances any dining environment.